Because I so love the way athletic preparation, challenges and accomplishments parallel much of what we face as speakers (and in life in general), I'm going to cover a couple more of the athletes and events I watched over the past few weeks during the Olympic Trials. If you didn't read the post about coming from behind to win, check it out, along with the video. Today, I want to talk about swimmer Michael Phelps, the 23-year-old winner of six gold and two bronze medals at the 2004 Olympics, and holder of several U.S. and world records. 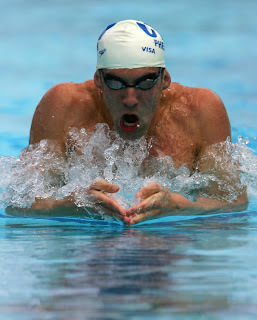 During the Olympic Trials, Phelps won all five of his events and broke two world records. He will have the opportunity in Beijing to break Mark Spitz' 1972 record of seven Olympic gold medals (anybody else have a big crush on Mark Spitz in 1972?). The interviewer after Phelps' final race asked, "Overall, how would you assess your performance in these trials?" Phelps responded, "I think there are a few things I could change between now and Beijing. . ."
"My turns, mostly. . . one or two things I can really fix and hopefully that'll make a big improvement over there." Commentator Dan Hicks observed, "Always the perfectionist, looking to get better." If Michael Phelps, U.S. and world champion and holder of gold medals and world records, still analyzes his performances, why aren't you analyzing yours? If Michael Phelps is still practicing before his events, why aren't you? If Michael Phelps still strives to improve his performance, why shouldn't you? When elite athletes rest on their laurels, they fail to improve and their skills decline. Are you resting on your laurels?